Broadcasting Press Guild Award for Radio Programme of the Year 2008. Royal Television Society’s Best Newcomers Award 1998. 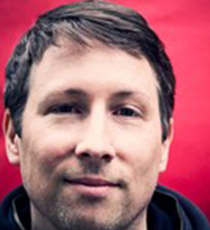 Joe Cornish is one half of the famous comedy duo Adam and Joe, as well as a successful writer, director and broadcaster in his own right. Joe first appeared on our screens as co-host and creator of The Adam and Joe Show, a home-made pop culture sketch show written, directed and presented with his childhood friend Adam Buxton. Over four series between 1997 and 2001, the show found considerable cult and critical acclaim, winning the Royal Television Society’s Best Newcomers award in 1988. Following The Adam and Joe Show, Joe and Adam went on to write and present several specials and series for Channel 4. Among these, Adam & Joe’s Fourmative Years was a satirical celebration of Channel 4’s birthday, and Adam and Joe’s American Animation Adventure was a series of comic explorations of the US animation scene. In the same period, Joe also wrote sketches for Big Train, co-authored The Adam and Joe Book, and co-hosted BBC3’s coverage of the Glastonbury festival. Transferring fully to the BBC in 2003, Joe and Adam wrote and presented Adam and Joe Go Tokyo, a Tokyo based comedy magazine show about Japanese pop culture. Adam and Joe took over from Ricky Gervais on radio station XFM in late 2003, and their show spawned a popular series of podcasts. In 2007 they moved to BBC 6 Music, where they hosted a three hour Saturday morning show, which was awarded the 2008 Broadcasting Press Guild Award for Radio Programme of the Year. Joe has also built a substantial body of solo work. As a presenter, he hosted the Channel 4 topical discussion show This Week Only alongside Nick Frost and Lauren Laverne, and he wrote and presented Radio 4’s film programme Back Row between 2002 and 2003. As a director, Joe worked on two Channel 4 comedy pilots in 2005, Modern Toss and Blunder, both of which were commissioned as series. He also directed the video for Charlotte Hatherley’s single I Want You to Know and an intimate documentary on the making-of Little Britain for BBC3. Joe is currently concentrating on screenwriting. He is working on a feature film adaptation of the Marvel comic book character Ant-Man, with Shaun of the Dead director Edgar Wright, as well as having just released his own screenplay Attack the Block for FilmFour. Most recently, Joe has been writing for Steven Spielberg and Peter Jackson on their feature film adaptation of Herge’s Tintin.